AMSOIL By-Pass filter installed on Skipper Liner houseboat. Each engine is a 5.0 MerCruiser. I used an AMSOIL SDF-26 filter and BE-100 bypass filter element mounted on a BMK-13 remote system. 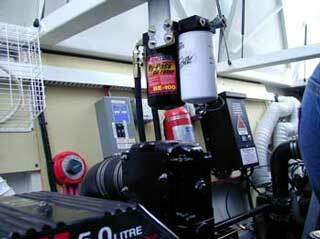 The power unit also has the same filter setup and the unit is a 12.5 KW four cylinder Westerbeke gasoline power plant. Previously it was run with petroleum based oil at 60hr intervals. With oil analysis I believe we can extend this to possibly once a season.